It’s easy to miss Mavic’s Speedcity wheelset among their road racing and mtn offerings; I think that Mavic missed a chance to jump on the commuter trend by not marketing this more. 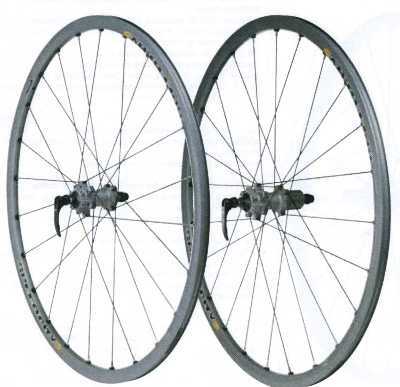 Mavic bills this as a way to road train on your mtb, but they should have said that this wheelset with their innovative spoking system and superb hub design is good to go in your disc-equipped 700C road/commuter bike. This would be a fine upgrade for many riders. You must search Mavic’s mtn section for these wheels, wedged between their cross-country and freeride models. Because you can swap this 700C wheel into a disc-equipped offroad steed, Mavic says you can use road tires and train on the road. Even if you have rim brakes, Mavic sells an interesting adapter to mount the V-brakes at the appropriate height. But most serious mtn bikers are going to have a real road bike to train on. I mean, use the right tool for the task, right? The rear hub is 135mm spaced, wider than the standard 130mm road standard. However, any bike made to take disc brakes is likely to have the wider spacing anyways. Bikes like the Salsa Casseroll. Speedcity are compatible with rim brakes, but the real value is linked to their disc mount (either ISO or Shimano’s “Center-lock” pattern). The relatively narrow rim makes it more appropriate to road 700C tires than big, fat “29-er” tires. Mavic’s proprietary “Fore” drilling, easily replaceable cartridge bearings, and straight-pull, steel spokes have given excellent service in wheels like the Ksyrium Elite. With a disc-brake, one should expect many seasons of use in rainy climates like Seattle. Speedcity wheels carry over from Mavic’s 2008 catalog without any changes, including the price. At $450/pr retail, the Speedcity wheelset competes pretty well against custom built wheels on comparable quality hubs.